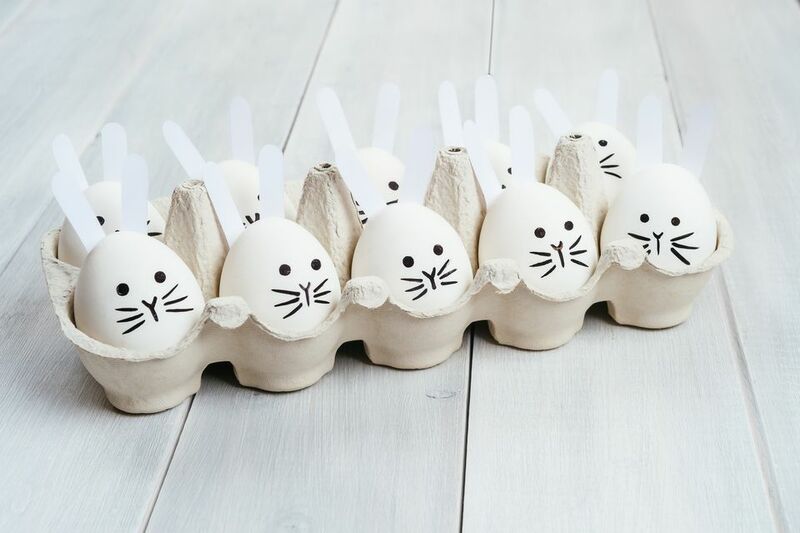 Nothing says Easter like adorable bunnies—and adorable bunny crafts! Here are some easy and cute bunny crafts you can make to celebrate Easter and the wonderfulness of spring! How adorable are these sock bunnies? 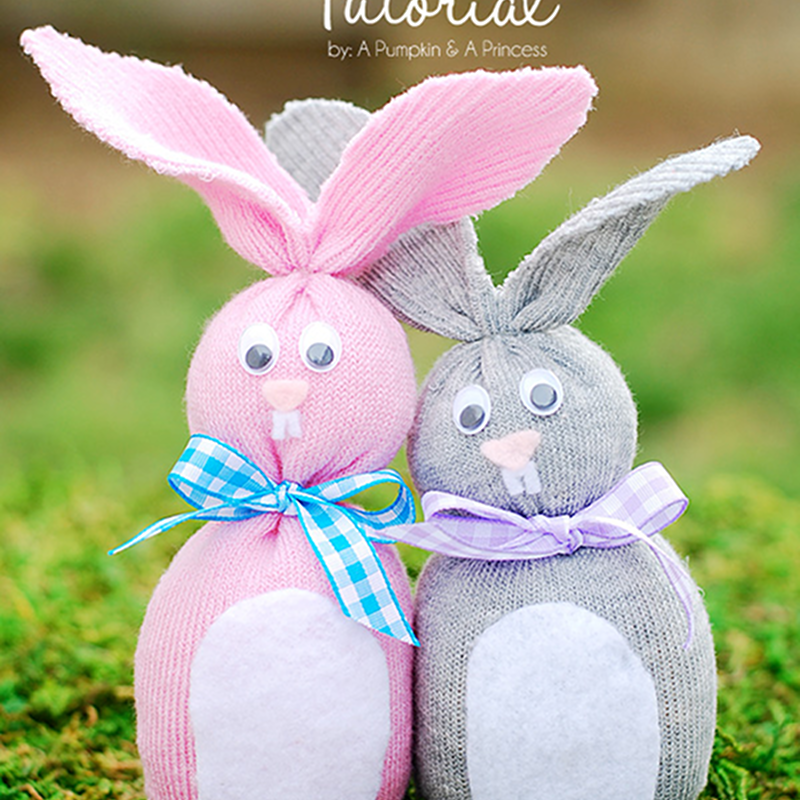 With just a few simple items from around the house—old socks, rice, rubber bands, felt, ribbon, and googly eyes—you can make these winsome bunnies. They're super fun and easy to make—a perfect craft to create with kids, but if you have pets, you might want to keep these cuties out of reach, since they'll probably be too tempting not to play with! View the sock bunny tutorial at A Pumpkin & A Princess. Hello, Easter party! These festive party hats are a cinch to make and are a must-have addition to any Easter party. You can make a whole batch for everyone to wear at your next Easter shindig in just a few easy steps, using easy-to-find materials like card stock paper, twine, and glue dots. So much fun! View the Easter bunny party hats tutorial at The House That Lars Built. Isn't it amazing how just a few simple materials like paper plates, pom poms, pipe cleaners and googly eyes can be transformed into cute critters like these Paper Plate Easter Bunnies? And this easy and fun craft is sure to keep the kiddos occupied while they cut, glue, and create these festive bunnies to celebrate Easter. View the paper plates Easter bunny tutorial at The Best Ideas for Kids. Your biggest challenge when making these absolutely adorable bunnies is stopping yourself from making too many! You'll need some thick yarn, a pom pom maker form (which you can buy at a crafts store or make out of cardboard), scissors, and a few other simple materials to create a whole batch of these irresistible and cuddly pom pom bunnies. View the pom pom bunnies tutorial at IKat Bag. When you think of Easter, you think of bunnies and eggs, right? This clever craft combines the two–how brilliant is that? You can use craft eggs (or get the cheap plastic kind and paint them white), some felt, pink and black acrylic paint, and white pom poms (because, of course, you'll need a tail for the back!). So adorable! View the Easter bunny egg tutorial at Little Red Window. Your Easter party treats will taste all the more delicious in these cute bunny cups. All you need are some white cups, mini pink pom poms, white cotton (for the tails, of course! ), googly eyes, black wire for the whiskers, glue and some ears (you can print out a template or just draw and cut out your own ear shapes), and voila! In no time at all, you'll have fun and festive cups you can fill with treats for your Easter party guests. View the Easter bunny treat cups tutorial at Giggles Galore. Here's a fun idea that lets you transform ordinary brown paper bags into fun Easter party bags, using nothing more than some scissors, pom poms, and baker's twine (You can use a hot glue gun, some really good glue or glue dots to secure the tails onto the bags). If you have a printer, you can use it to print out the gift tags, or you can make your own. In minutes, you'll have a bunch of bunny bags to fill with Easter candy and other treats! View the Easter bunny bag tutorial at Craftaholics Anonymous. You'll love, love, love these pretty origami Easter bunny baskets. With some pretty patterned paper, you can make several and fill them up with Easter candy or little knick-knacks. The website is in German, so the translation may be a little wonky, but the instructions are pretty clear (and worth it!). View the origami bunnies tutorial at Minidrops. Whether you're an old hand at crochet or a newbie, you'll have no trouble whipping up these lovely little bunnies. They're so much fun and easy to make, you'll want to crochet a bunch of these cuties to make a garland, attach to a scarf, gloves or anything else you can think of! View the crochet bunnies tutorial at Sparkles of Sunshine. Here's a cute paper Easter bunny you can make in minutes with the help of your little ones. You probably have all these materials already—construction paper, scissors, a marker, glue and googly eyes. It doesn't get much easier, and it's loads of fun to make too! View the paper Easter bunny tutorial at Easy Peasy and Fun.